Welcome to the Beer of the Night for this young Halloween 2006. Tonight's beer selection we see ourselves have a virtual trip across Canada, going from Quebec last night with the beer by La Barberie called La Moisan, to today going to an entirely different part of Canada, Alberta. Alberta is much different than Quebec in culture, political ideology, and of course geographically. 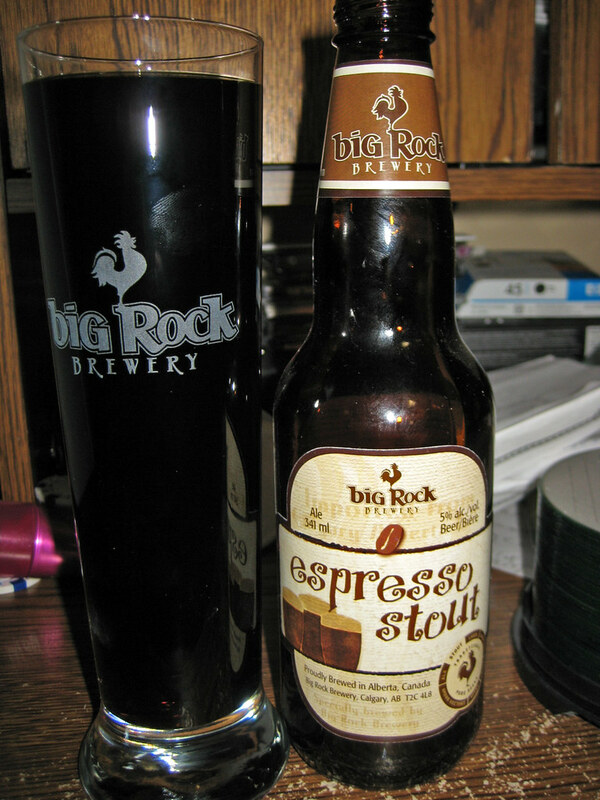 Tonight's beer selection is Big Rock's Espresso Stout. The Espresso Stout brew is not a regular beer by Big Rock, this beer is only aimed towards around Christmas season, as a seasonal product. The contents of the Espresso Stout package include 4 335ML bottles, 2 Big Rock branded bar glasses, and a bag of chocolate covered espresso beans, made by Calgary's own Les Truffes. When I picked up this case, I was expecting a Guinness-like brew, but as we all know, there is no such thing as a stout that is anywheres near the taste of a Guinness. I'm a bit scared of stouts myself so I was a bit hesitant to try this brew. I'm glad I purchased this special edition product, because it's much more different than what we're used to with current mass made beers. It has the obvious darkness in colour to stouts, coffee or a porter. The taste started off as a very neutral, but creamy flavour, it's as if you're drinking water, but as the drink went down, it started to have an espresso-like flavour, which will be inviting to anyone who is a fan of espresso or coffee. The smell is similar to that of a porter, but much lighter. All in all, a very decent beer, a good beer to drink around the Christmas season when having Christmas desert with family or friends. I did get a weird buzz off of this beer oddly enough, even after the first few sips, however not a "drunk" sort of buzz, I'm thinking it has something to do with the espresso in the beer. The package costs approximately $10-$15 Canadian depending on where you live, I'm not too sure on the availability but I would imagine it would be mainly sold in Western Canada. If you are able to find a pack, feel free to try it out, or buy it for a coffee/beer connoisseur friend or family member. Flavour: 3.5, very inviting for coffee connoisseurs.